Product #1057 | SKU 19-001-0005 | 0.0 (no ratings yet) Thanks for your rating! 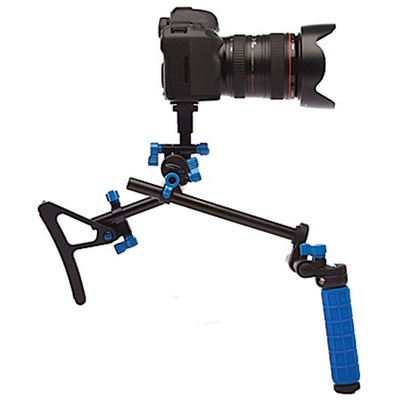 The Redrock Micro nano - Stealth V (pronounced "vee") is a compact DSLR support rig that utilises an extended handgrip to bring stability and maneuverability to handheld video and photos. Attaching to the bottom of the camera via an included baseplate, the Stealth V's adjustable body pad extends against your chest while the rubberised handgrip lets you support the camera from below. Perfect for on-the-go, eye-level shooting, this lightweight rig helps keep images stable and arms relaxed.